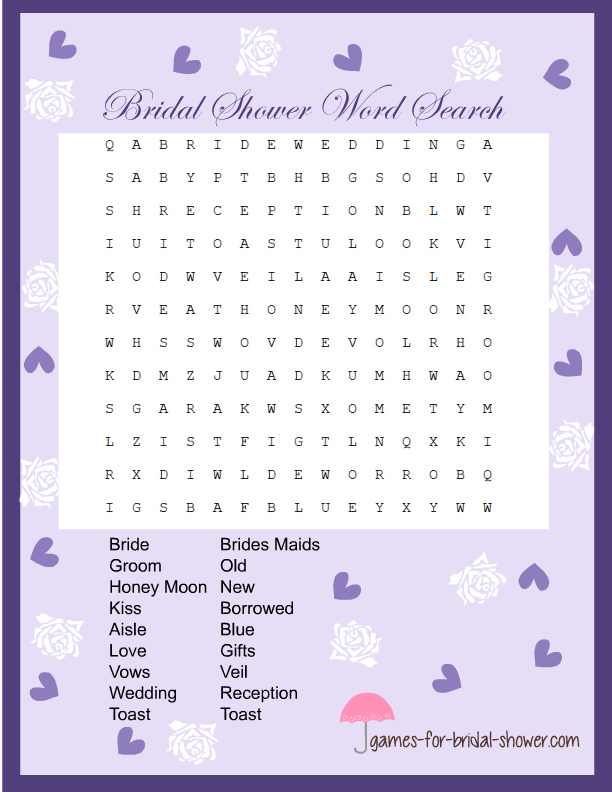 Word Search is also a very popular party game so I have created these free Printable Words Search Game Cards in three different colors so you can choose and print any of the color that go with your Bridal Shower theme. I have used just wedding related words in this game so guests will thoroughly enjoy playing this game on a Bridal Shower Party. How to Play: Take print outs of this game on card stock or any other paper of your choice according to the expected number of your Bridal Shower Party Guests. Distribute the Game among the guests along with a pen and ask them to find all the words given on the game card. You can either set a time limit of 3,5 or 10 minutes or you can say that the guest who will find all the words first will be the winner. Click on the word searh game image shared above to get the printable version of this word search game in brown color. This adorable game card is decorated with hearts and roses and your guests will simply love playing this game. Pink is my most favorite color for these games but of course you can print games in any of the four colors that I have provided. Just click on the image shared above and save the pink word search game in your computer that you can print later. This is another beautiful color for this game. 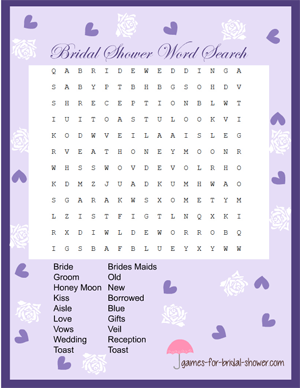 This game card is decorated with hearts and white roses and this lilac color will be simply loved by anyone.